Producers Says Who? & DJ Vindictiv bring you: FREMDVIBES! A free download EP on soundcloud, filled with jazzy sounds, sunny vibes, orginal samples, turntable-sorcery, crispy beats and lots of vinyl-dust. The two Dutch producers combine forces to take you on a mesmerizing, breathtaking trip. 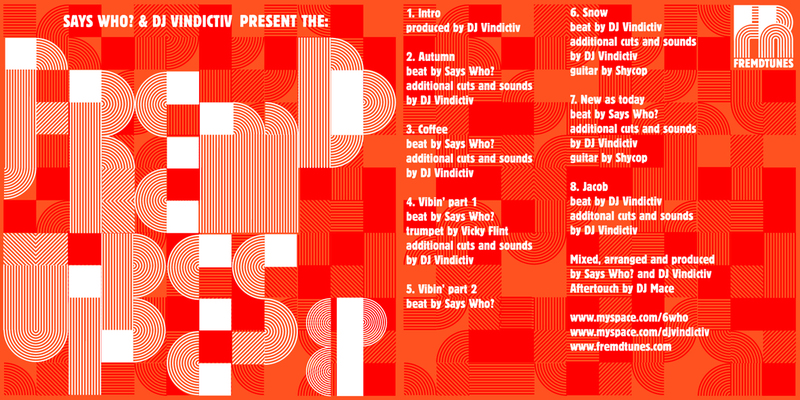 British Trumpet player Vicky Flint and Dutch guitarist Shycop assist the two on this online, free give-away release brought to you by Fremdtunes. Gorgeous ep! I couldn’t resist writing about it on http://www.eclectro.nl/2010-05-29-fremdtunes-brengt-jazzy-levensgeluk. Next Post FREMDTUNES IS LOOSE!